Recipe is in the above link. I love macaroni and cheese and I love kugel. This original recipe of mine, presented on Tami Weiser’s Weiser Kitchen blog, shows you how to fuse both soul and Ashkenazi Jewish cooking together to make a dish full of flavor and history. I really hope you enjoy it and make it to go with your favorite summer treats. It’s the best of both worlds and makes a spectacular side dish for a potluck or holiday meal. Essen mit simcha! As an African American who happens to be Jewish, or a Jew who happens to be African American, I am obligated to love two things—macaroni and cheese and kugel. They are basically the same idea–only they aren’t. Kugel seemed to me a weird sweet cinnamony macaroni and cheese—without the right cheese and because kashrut demands a separation of dairy and meat, I had to get used to eating macaroni and cheese as an entree or appetizer rather than as a side dish since it’s traditionally eaten with a number of meat dishes in buffet form. But, when in the shtetl–eat as the Jews do–so I learned how to love it. I make traditional kugels with cream cheese and sugar and raisins and the like and I make Southern kugels with peaches and crumble toppings and different types of spices. Macaroni and cheese had several introductions into American life, but the most important was by way of James Hemings, an enslaved chef held by Thomas Jefferson. You’ve probably heard that Thomas Jefferson introduced macaroni and cheese–he kinda did, he certainly imported a macaroni making machine to aid the preparation of the dish when he got back to his mountaintop home at Monticello. However it was James who learned the recipe and “hooked it up.” Macaroni and cheese and kugel are essentially descended from a late Medieval era pasta like dish that emerged in Italy and spread into France and England. Jefferson’s Black cooks’ success was not so much in replicating French cuisine-which they could certainly do–but they added touches and flourishes of the South and African American foodways such as they knew. Over time, “macaroni pie” as it was called, and is still called in the Caribbean became a popular celebration dish among African Americans and for many became a soul food staple. 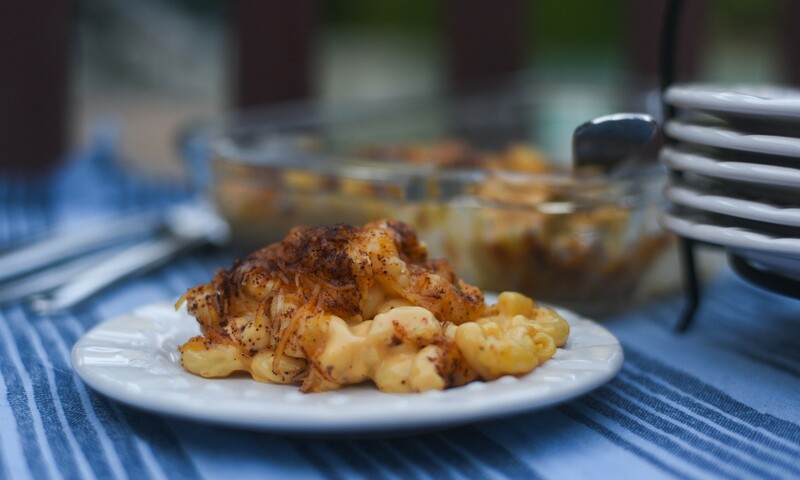 So here’s my challenge–how do I enjoy a koshersoul macaroni and cheese that’s also a kugel—here’s my answer–after much experimentation. Photo by Tami G. Weiser. Looks so good! Mac + cheese is my jam!